Krabi province is no stranger to the revolving door of year round visitors, and they arrive in mass by land, sea and air. But for first time visitors (like me), the Krabi expanse may not be as simple to negotiate for some as for others. Having, at the very least, an accommodation to initially head to will make for an easy transition for those like me who prefer to get settled in quickly and smoothly. Rest assured there are plenty of places to stay to accommodate all types of travelers, as well as more budget friendly finds that even have a few luxury perks attached. 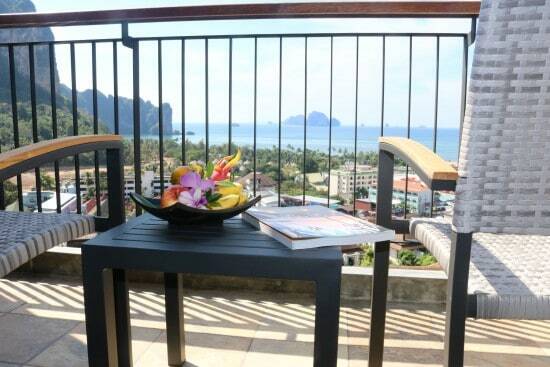 AoNang Cliff Beach Resort in Aonang Beach is such an accommodation. From spacious garden view rooms to luxurious panoramic view hilltop suites, AoNang Cliff Beach offers the best of both worlds and an excellent choice for new or return arrivals. Need more convincing? 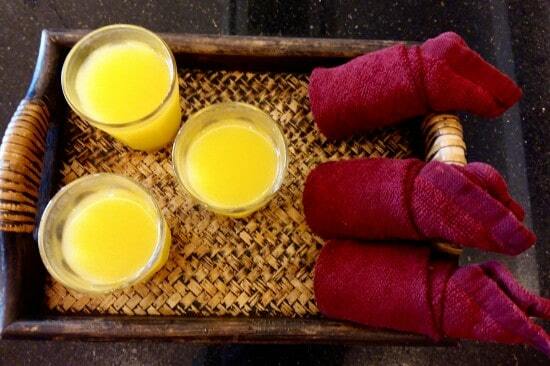 Here are 10 excellent reasons to stay at AoNang Cliff Beach Resort. 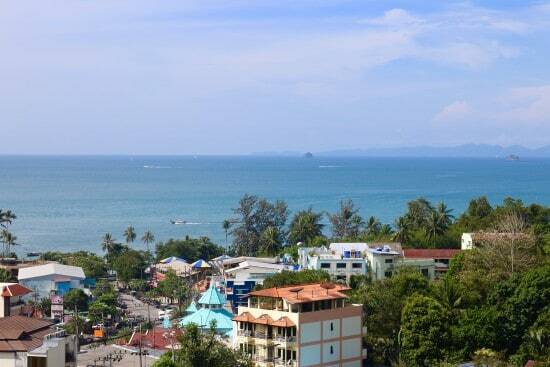 Aonang Beach township and the waterfront are within walking distance. From online photos the AoNang Cliff Beach may appear somewhat remote, as it’s perched quite elegantly on a rather towering hill. But! The unique layout of the grounds actually cascade downward from their glorious hill top Panorama Suites Wing to the walking street below. Is it a labor intensive trek or a necessary shuttle up and down? No. A few steps here and there and convenient elevator service make resort travel a piece of cake. Eateries and shops are also plentiful along the resort’s adjacent front street, so you’ll have little need to wander too far away. It’s also a mere 10-15-minute walk to the seaside where the colorful waterfront menagerie awaits. And for those who prefer to chill out at the resort’s private beach at the Andamana Beach Club, free daily shuttle service is offered four times a day from 10:00 until 18:00. They knew I’d be extra thirsty. With the lively street directly in front of AoNang Cliff Beach’s front lobby entrance, the resort itself blends in unobtrusively with the rest of the neighborhood. But once across the threshold, the resort’s unique ambience becomes quite noticeable. This resort is simply relaxing from the get-go. The professional staff themselves set the tone as check-in is swift and without the confusion that can often be typical of popular resorts. And despite the distant sounds of area construction and occasional honking horns, in addition to the relaxing earth tone color schemes, the resort’s natural design elements seem to buffer those external sensory intrusions of ‘noise’. Super comfortable beds and loads of leg room. Incredible panoramic views from your private balcony. Although there are numerous hotels and resorts in the Aonang Beach area, AoNang Cliff Beach Resort has bragging rights on the best view. Their panoramic vista of those iconic limestone cliffs and distant islands will be etched in your vacation memory forever. And once the sun fully pops up from behind the nearby mountains, the shimmer of the surrounding ocean against the blue sky induces a magnetic pull of contentment. It took all my efforts just to leave my balcony except I knew the infinity pool also offers an incredible view. Sunsets? No problem. At the end of the day the resort’s rooftop bar The Peak is the place to be. An infinity pool with jacuzzi sunloungers! The AoNang Cliff Beach actually has two pools. One is more child and family friendly, but their panoramic infinity pool was much more suitable to my own taste. This pool is almost beyond words. A salt water infinity pool with an incredible panoramic view, plenty of sun loungers with sun and shade available, food and beverage service at your finger tips and the kicker? Jacuzzi loungers in the pool! The infinity pool is quietly reserved for adults who might want to unwind with a good book or just stare into space. They do have poolside music, but at a relaxed low volume, which ensures you can still hear the trance-inducing whisper of the trees. An early morning visitor making his rounds. It isn’t an easy or inexpensive task to build a resort and be respectful of nature, but AoNang Cliff Beach has done an amazing job at tucking themselves gently among the trees. Large gaps through some of the resort’s concrete structures allow trees growth and breathing room and are cleverly disguised with loose a square of artificial grass. So if you see a seemingly stationary tree moving it probably isn’t your beverage choice playing tricks on you! For nature lovers, where there are trees and quiet you’ll often see wildlife happily chattering about with their daily meanderings. Imagine sipping coffee on your balcony and watching colorful Kingfisher birds and even a few cheeky monkeys passing by; all possible at AoNang Cliff Beach Resort. Oh, and as tempting as it can be, do not feed the monkeys. 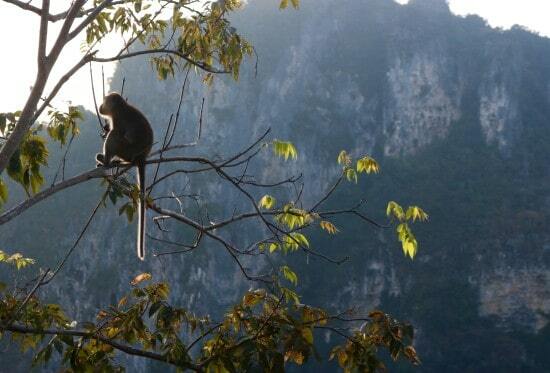 Single lone monkeys often have an abundance of friends nearby and word can travel fast! With ample eating and drinking venues on site, there is little reason to leave the AoNang Cliff Beach property in search for food. 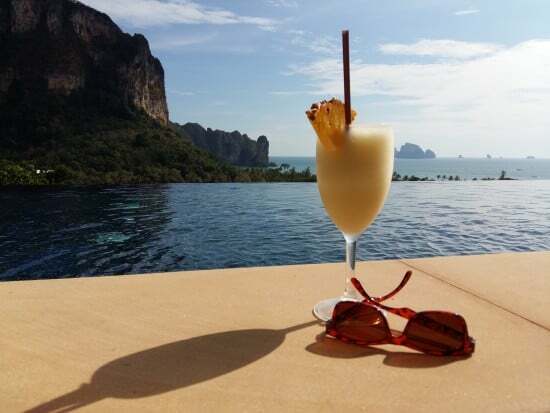 With an inclusive breakfast or an evening buffet at AoNang Buffet, cliche worthy poolside cocktails or a special delivery from room service, the selections are endless and delicious. And for those who’d like to take their culinary adventures one step further, the Cliff Sala offers special Thai cookery classes! Bonus points for the resort’s Infinity Spa. Their services are top notch and surprisingly inexpensive. 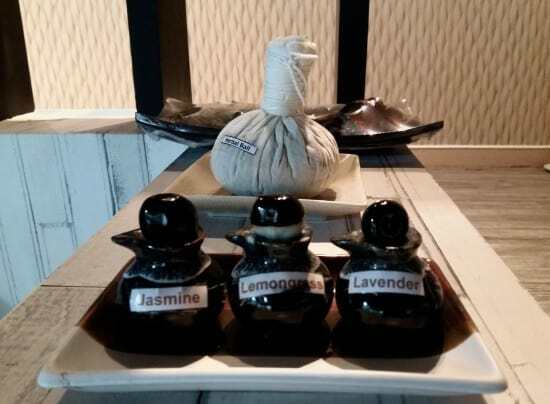 It wasn’t easy to choose from their extensive menu, but I opted for the Aroma Bliss Massage with lavender. That 60-minute treatment did indeed live up to its name and I was a very happy and relaxed camper. I did try a couple of massage venues outside of the resort and there was absolutely no comparison. So if you want the real deal in a quiet professional environment I highly recommend a visit to the Infinity Spa. They are open daily from 10:00 until 20:00 and they also offer a daily happy hour with generous discounts from 10:00 until 14:00. 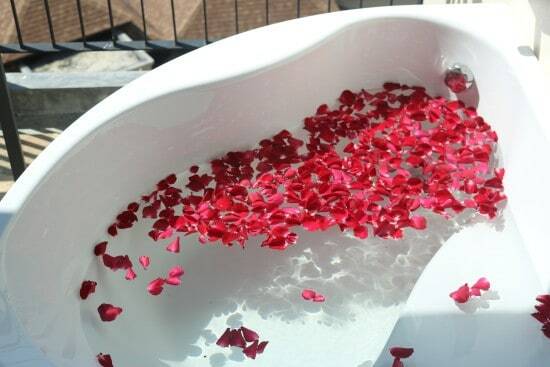 The indulge yourself balcony tub works for me! 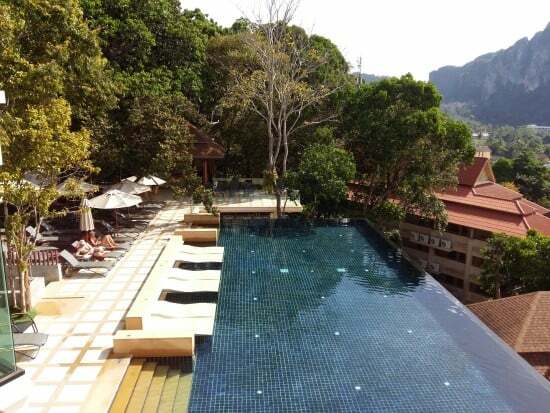 Whether you are embracing a bit of self love or vacationing with a loved one, AoNang Cliff Beach Resort is romantic. But not in a mushy way so that solo guests suddenly feel depressed that they’re alone. In fact, the couples I met were all super friendly and talkative. That ‘chilled out’ vibe that can come with a relaxing resort. As sappy as this sounds, we all had one thing in common. And that was that we had chosen an awesome resort and were happy guests. But if you do want your own space, it’s quite easy to indulge yourself. From the private balconies with outdoor tubs to those scenic roof top sunsets, you will definitely reconnect with yourself or your love interest. 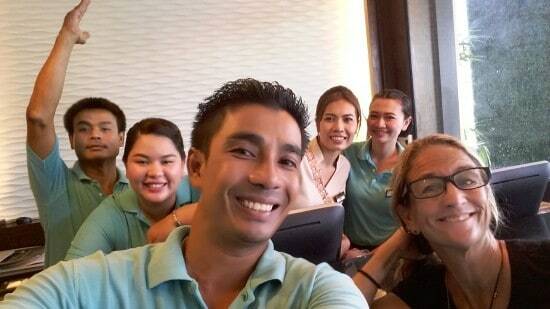 Another shout out to the wonderful staff of AoNang Cliff Beach Resort. Every staff member I encountered during my visit went above and beyond to make me comfortable, and that attention was given to all guests (from what I saw). The smiles were genuine and the pride apparent. Happy staff are a direct reflection of superb management as well as a management that lets their staff know that they are appreciated. Great customer service is something I truly appreciate when it comes to my personal ‘guest experience’ and at AoNang Cliff Beach they make the guest experience a priority. I was an invited guest of AoNang Cliff Beach Resort, but my opinions are my own. If you’d like a relaxing place to chill out, I highly recommend this resort. definitely on my wish lists. You certainly convinced me that this is the right place for me when I go to Krabi! Those views and that infinity pool are enough for me, haha, but that spa finishes the negotiation in my mind right off. 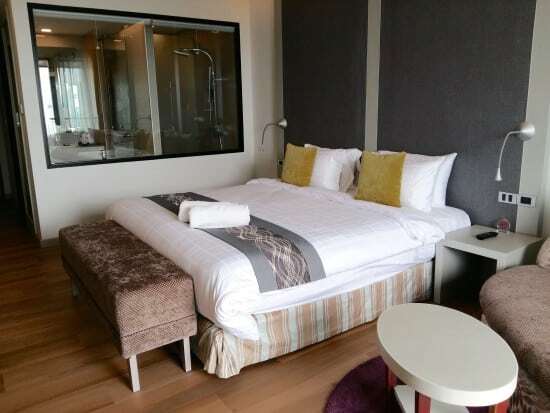 Thanks for sharing this wonderful roundup on an excellent hotel! You will get spoiled Duke! I’ve been planning my return trip since I left, because it really is perfect! I stayed there last year and have to say that I love it especially the wonderful staff.